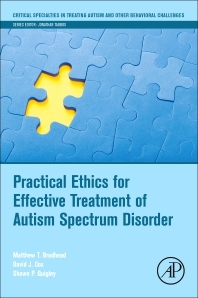 Practical Ethics for Effective Treatment of Autism Spectrum Disorder is for behavior analysts working directly with, or supervising those who work with, individuals with autism. The book addresses important topics such as the principles and values that underlie the Behavior Analyst Certification Board’s ® Professional and Ethical Compliance Code for Behavior Analysts, and factors that affect ethical decision-making. In addition, the book addresses critical and under-discussed topics of: scope of competence; evidence-based practice in behavior analysis; how to collaborate with professionals within and outside one’s discipline; and how to design systems of ethical supervision and training customized to unique treatment settings. Across many of the topics, the authors also discuss errors students and professionals may make during analyses of ethical dilemmas and misapplications of ethical codes within their practice. This is an excellent book for both practitioners and instructors. Very easy to read, and a very much needed addition to the literature on ethics in ABA. Matt Brodhead, Ph.D., BCBA-D, is an Assistant Professor in the College of Education at Michigan State University. Like many before him, his interests in behavior analysis and autism began at Croyden Avenue School in Kalamazoo, Michigan. Raised in Harbor Springs, Michigan, he has an undying passion for spending time in the great outdoors, especially with his loving wife and adventurous daughter. When he can’t get outside, he enjoys listening to and playing music, and in a previous life, he used to tour with a funk band. David J. Cox, M.S.B., BCBA, is a Ph.D. Candidate in Behavior Analysis at the University of Florida. David has worked clinically related to autism and behavior analysis since 2006. He has published 13 peer-reviewed articles related to ethics, choice behavior, and verbal behavior. His research focuses on furthering a basic understanding of complex choice behavior, the multiple control of verbal behavior, and how those areas of knowledge can be applied to change health behavior and ethical behavior. David will begin a post-doctoral fellowship in the Behavioral Pharmacology Research Unit in the Department of Psychiatry at Johns Hopkins University School of Medicine in July of 2018. Shawn Quigley, Ph.D., BCBA-D, is the Senior Director of Clinical Services and Professional Development at Melmark, PA. Dr. Quigley has supported individuals with developmental disabilities in various capacities over the last 15 years. He has a passion to support the behavior analytic profession through service, research, teaching, and clinical work. In his spare time he can be found enjoying food, sporting events, and the outdoors with his wife and four children.